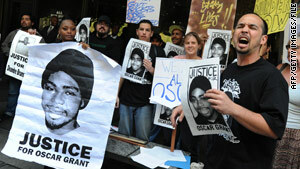 Members of LA Coalition for Justice for Oscar Grant protest outside a pretrial hearing for Johannes Mehserle. San Francisco, California (CNN) -- Jurors wrapped up deliberations Friday and will continue next week in the racially charged murder trial of a white former police officer in Oakland, California, accused of killing an unarmed black man. Jurors deliberated for nearly three hours Friday afternoon without reaching a verdict in the case against Johannes Mehserle. Mehserle, a former Bay Area Rapid Transit police officer, is accused of shooting 22- year-old Oscar Grant dead on a California train platform on January 1, 2009. The jurors will resume their deliberations Tuesday morning; court is closed Monday due to the extended holiday weekend. Closing arguments concluded earlier in the day Friday. Mehserle could be found not guilty, guilty of murder, or guilty of a lesser offense like manslaughter. The shooting was captured on a bystander's cell-phone video camera. The video was widely circulated on the internet and on news broadcasts, and it spurred several protests and riots in and around Oakland. The trial was moved from Alameda County to Los Angeles due to pre-trial publicity. Bay Area Rapid Transit police were called to Oakland's Fruitvale station on January 1 after passengers complained about fights on a train. Officers pulled several men, including Grant, off the train when it arrived at Fruitvale. The video showed Mehserle pulling his gun and fatally shooting Grant in the back as another officer kneeled on the unarmed man. Mehserle has said at the trial that he intended to draw and fire his Taser rather than his gun, CNN affiliate KTVU eported. Mehserle resigned his position a few days after the incident and was later arrested in Nevada. He was released on a $3 million bond. Meanwhile, police in Oakland are bracing for riots as a verdict nears in the racially charged trial. An Oakland police department website has messages from the police chief and the mayor of Oakland warning people to stay calm. "We anticipate that regardless of the verdict reached by the jury, demonstrations could occur in downtown Oakland, and potentially throughout the city," one of the messages said. "We will not tolerate destruction or violence. We live here, and we love Oakland. We understand that the community is grieving, and we are in this together. We will get through this together." Grant's family filed a $50 million wrongful death lawsuit against the officers involved in the incident. In January, the transit system agreed to pay $1.5 million to settle the suit. The money will provide financial support to Grant's young daughter.